The innovative PFE series allows designers to utilize a single device containing power factor correction, regulation and primary secondary isolation, offering up to 50% space savings over previous products. These modules meet the needs of many industrial, datacom and telecom applications particularly where high operating temperatures are required. The fully regulated PFE 500-watt models are available in 12, 28 and 48–volt nominal outputs and can be adjusted over a ±20% range. The 12-volt PFE500 delivers 396-watts with a maximum base-plate temperature of 85 oC, while the 28 and 48-volt models provide 504-watts at 100°C base plate temperatures. Line and load regulation is 0.4%. The semi-regulated PFE700-48 can deliver 714-watts with a nominal output of 51-volts and can be operated as an intermediate bus converter powering regulated DC-DC converters for multiple output applications. Maximum base-plate temperature is 100°C, derating linearly to 85% load above 85°C. 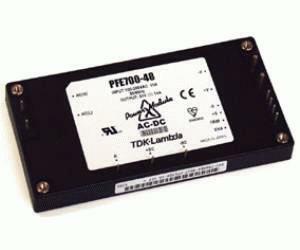 Line and load regulation for the PFE700-48 is 4-volts. The PFE series accept a wide AC input from 85 to 265VAC, have active power factor correction and an input to output isolation of 3000-volts AC. All models have over-voltage, over-current and over-temperature protection.